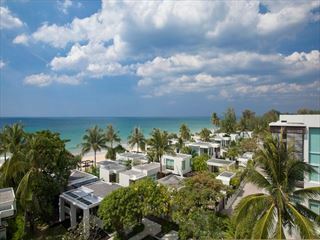 Surrounded by azure waters of the Andaman Sea and the tranquil coast of Pansea Beach, The Chedi Phuket is the gateway to a tropical island paradise. 108 thatched cottages sit cosily under a canopy of coconut groves, where landscaped slopes gently descend to meet a private stretch of sandy shore. The appeal of the spacious 89 one-bedroom and 19 two-bedroom cottages is further enhanced with private verandahs, secluded sun decks, and handcrafted teak floors. A diverse retreat is expected with relaxing spa services, delightful dining venues, practical meeting facilities and exciting recreation. 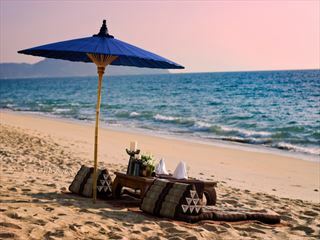 The Chedi complements the rustic serenity of Phuket with its warm spirit of true island hospitality. Linked together by a lattice of steps and walkways, all cottages feature luxurious bedrooms with dressing areas and generous outdoor spaces. Amenities include mini-bar, air conditioning, satellite TV, direct dial telephone, personal safe and complimentary coffee and tea making facilities. The size and décor of the suites differs from the cottages and they have the additional features of bath tub, flat screen TV and Bose Sound Dock with 2 iPods. Lomtalay Thai Restaurant serves authentic Thai cuisine in a breathtaking setting. Guests enjoy unobstructed views of the Andaman Sea with delightful indoor and outdoor seating arrangements. Live classical Thai music complements the enchanting dining experience. 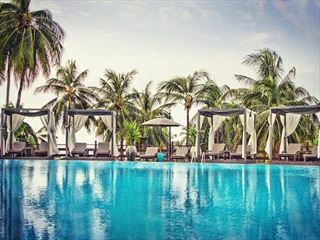 The Sunset Café offers an eclectic mix of Asian and Western cuisines, snacks and refreshments are available throughout the day at this casual venue overlooking the beach and pool. Enjoy refreshing cocktails and after dinner drinks in the chilled-out setting of the Sunset Bar.